Providing the highest quality of care to our patients is every Kentucky hospital's highest goal. 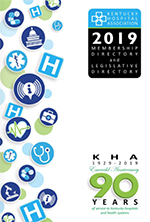 The KHA Annual Quality Award, Honoring Leadership and Innovation in Patient Care Quality, Safety and Commitment, was created in 2006 to honor and spotlight those hospitals excelling in patient safety and quality efforts. There were a record 27 applications this year! The following six hospitals demonstrated commitment to innovation and leadership in providing quality patient care. A copy of each winner's award application is below.